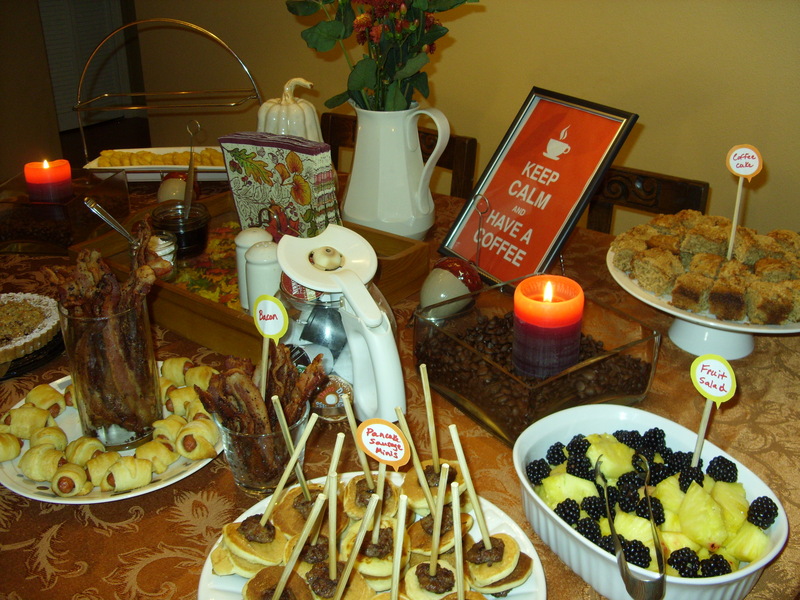 I’ve just been dying to show you all my Fall Coffee Brunch Party that I held last month. 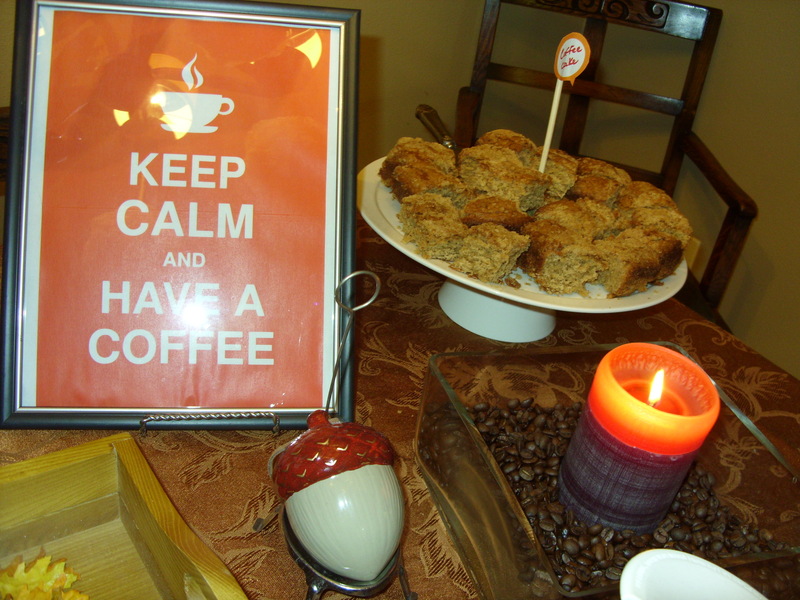 I was so excited when I was chosen as a host for a Keurig House Party and went all out with the coffee theme! 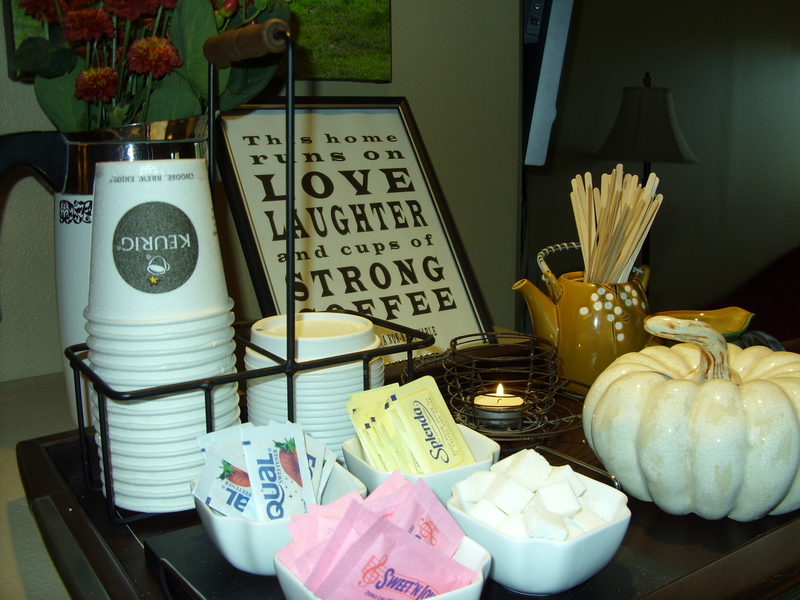 What is more cozy in fall than a good cup of coffee and a nice brunch shared with friends and family? 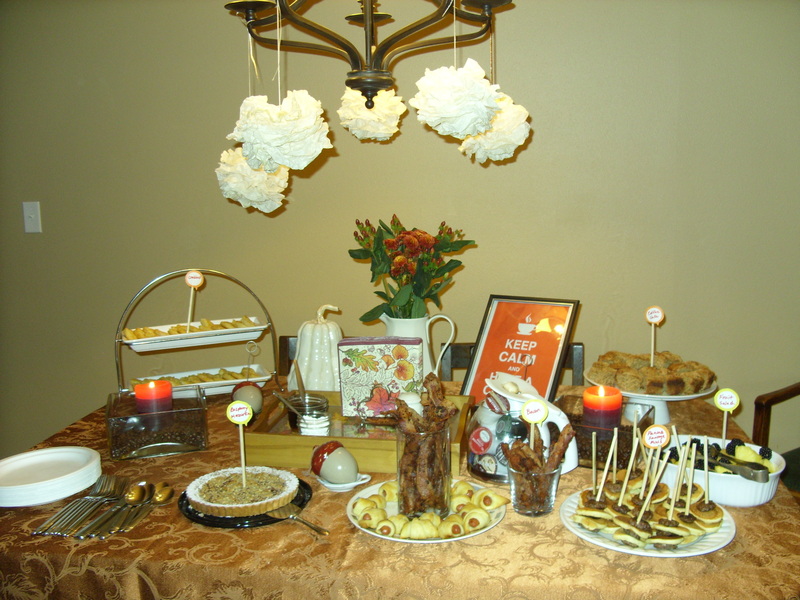 This party was so much fun to put together! And by deciding to go easy on myself and make it a potluck, I was able to get out of the kitchen and enjoy my guests even more. With less time spent on menu planning, I focused my energy more on the decor where I married the brown tones of coffee with the other beautiful colors of fall. But of course I still felt like contributing a few things to the meal myself. 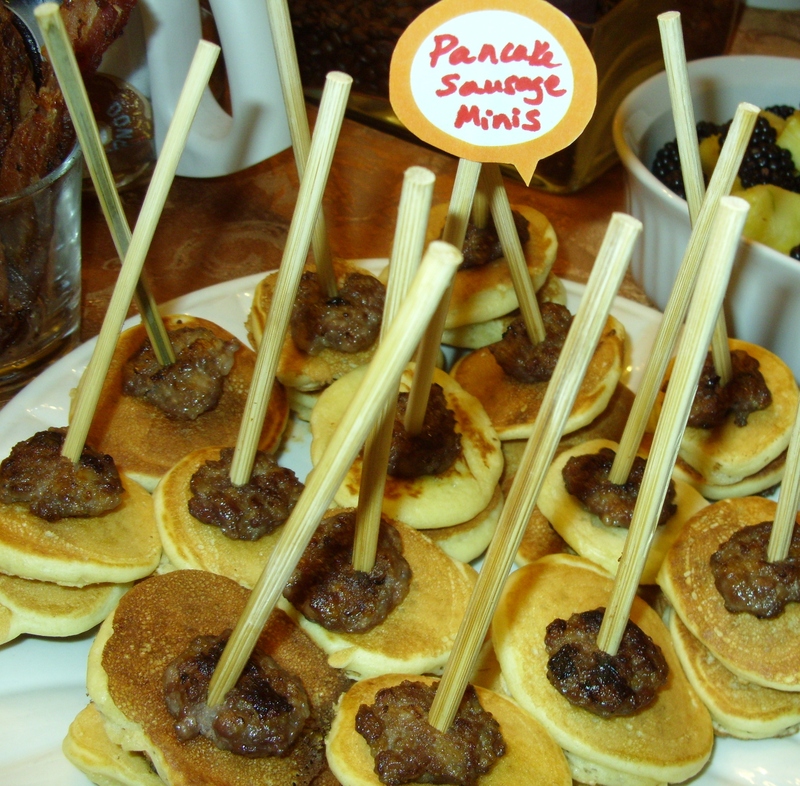 My signature food on a stick made an appearance – fabulous pancake and sausage minis. 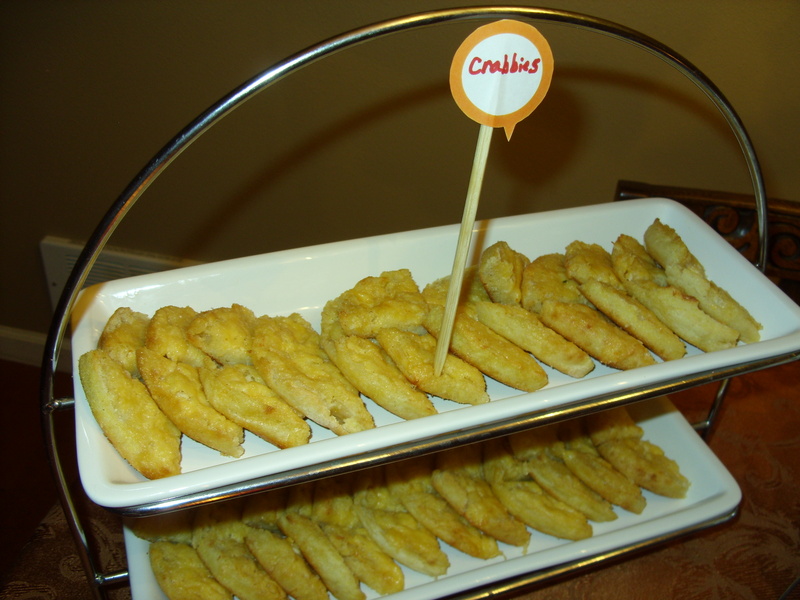 I share how to make these here. 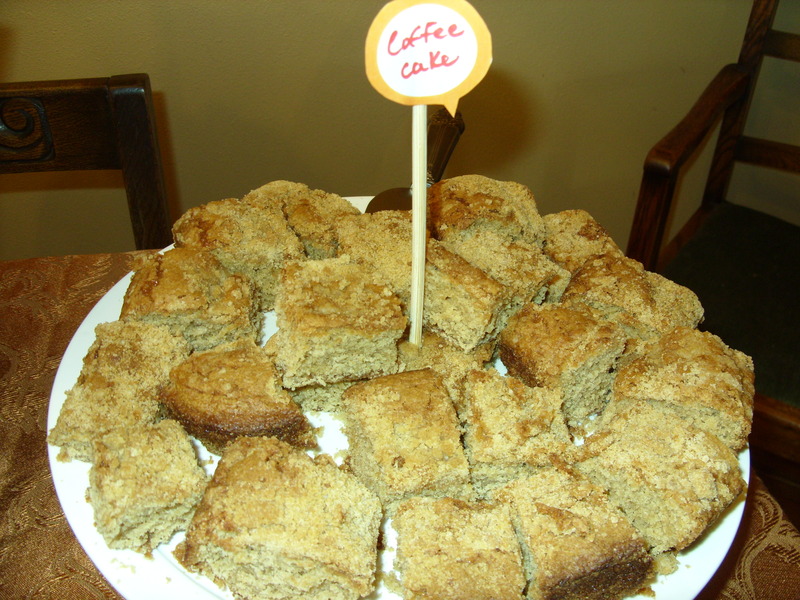 I made this coffee cake recipe for the first time and it was delicious! (Though we left out the nuts.) This is going in my repertoire for sure! 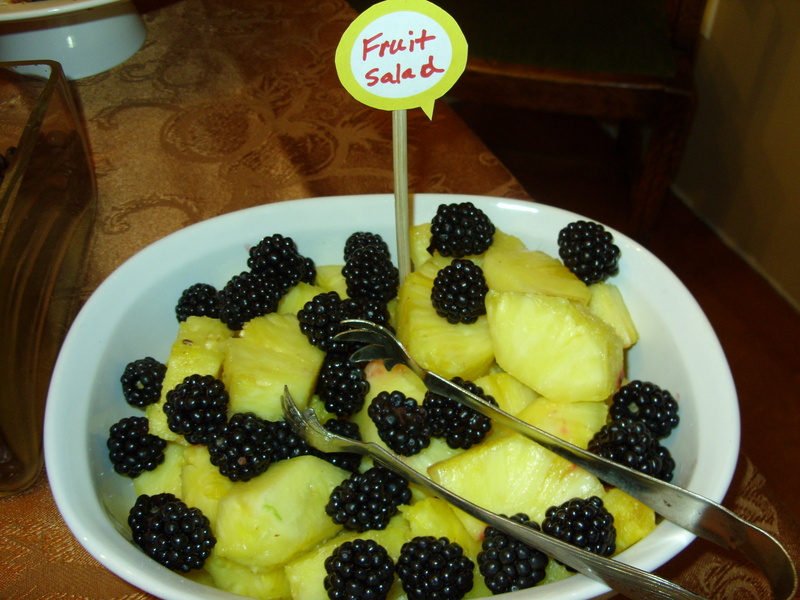 I also attempted a fruit salad, but the watermelon I had picked up was rotten, so it was just pineapple and berries for this salad. My 12 year old son questioned me on this one. “How can you call it a fruit salad with only two items?” (I have taught him well!) 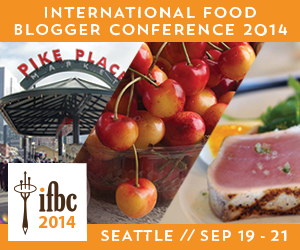 But this was a great lesson in going with the flow and not freaking out because the “salad” wasn’t perfect. My friend Stacey just cracked me up with this one! 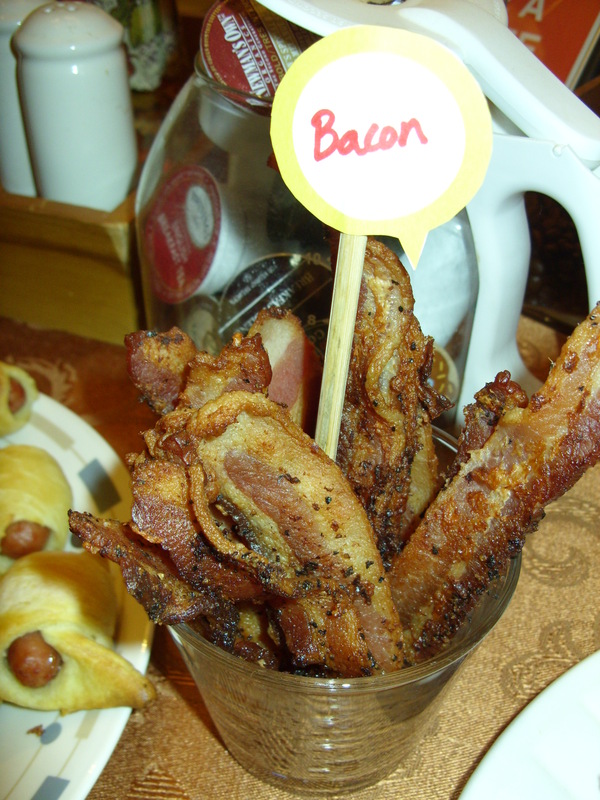 A glass of bacon! Brilliant! She said she actually got the idea from my blog – bonus points for her. And proof that one does not have to go overboard in the kitchen to contribute to a potluck. 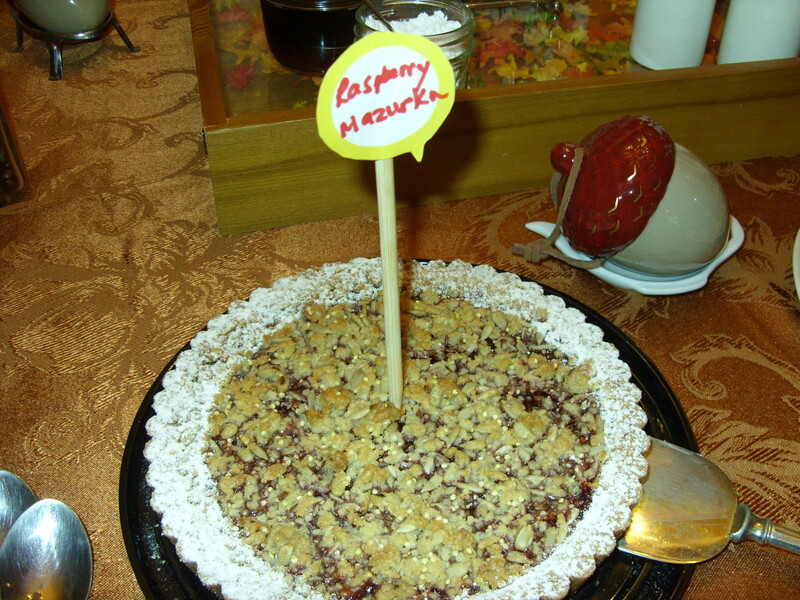 I was just so happy that my friend Joy and her family were there spending their morning with us – and this fantastic raspberry pastry she brought from the local grocery store bakery couldn’t have been a more perfect addition to the meal. I found these free printable signs online, here and here, to help me with my table decor and popped them into simple, black dollar store frames. The menu tags really came in handy as well. The calming scent of coffee permeated the room with this fun candle set-up – all I did was pour a bag of coffee beans into a square glass vase that I had on hand and placed a lit, fall-colored candle in the center. 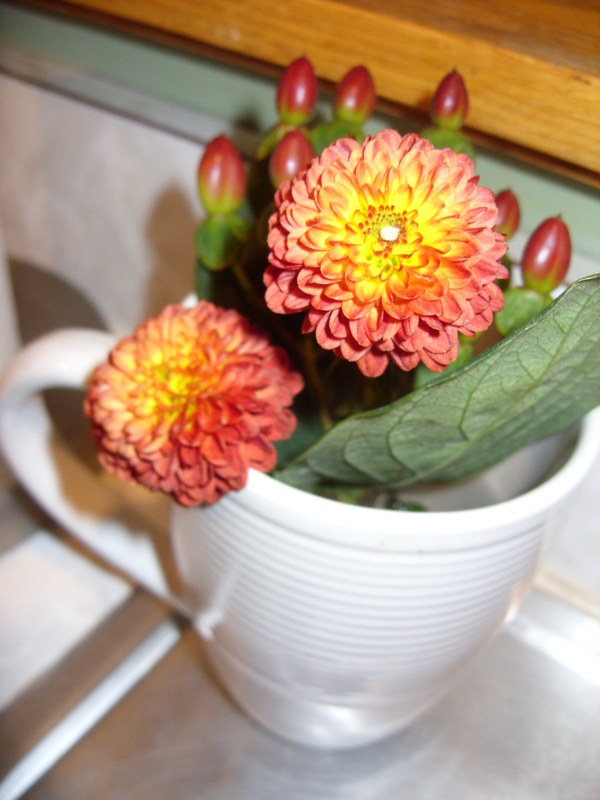 Since the Keurig uses no carafe, or coffee filters, I turned these items into decorations for the room. 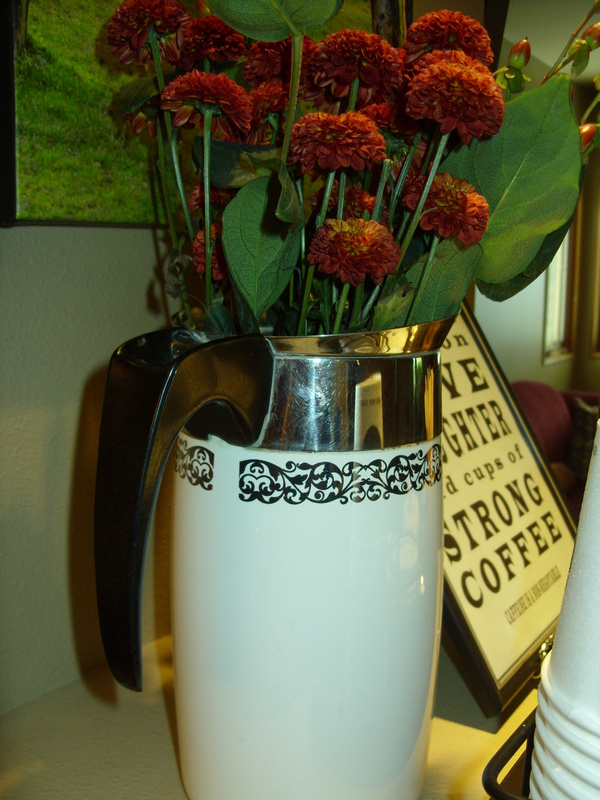 My old coffee pot was perfect for holding extra K-cups. 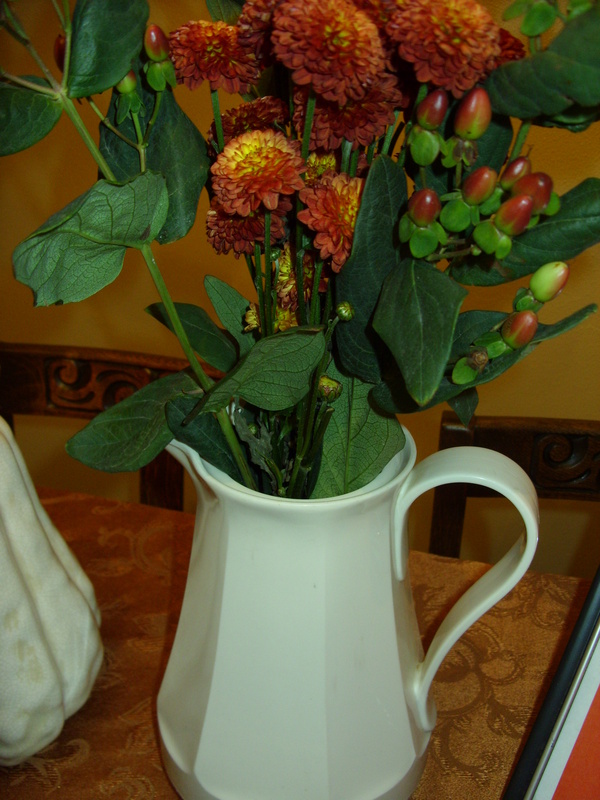 And these carafes looked just lovely around the space with autumnal flowers placed in them. 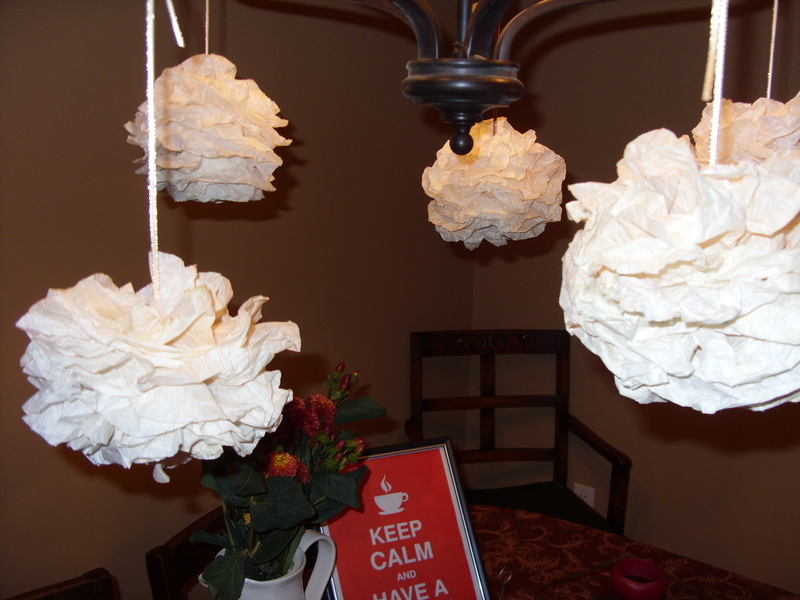 Coffee filters re-purposed as hanging pom poms completed the look. I just love my new Keuring! Thanks House Party! This is the most wonderful tool for entertaining or for when you have house guests. 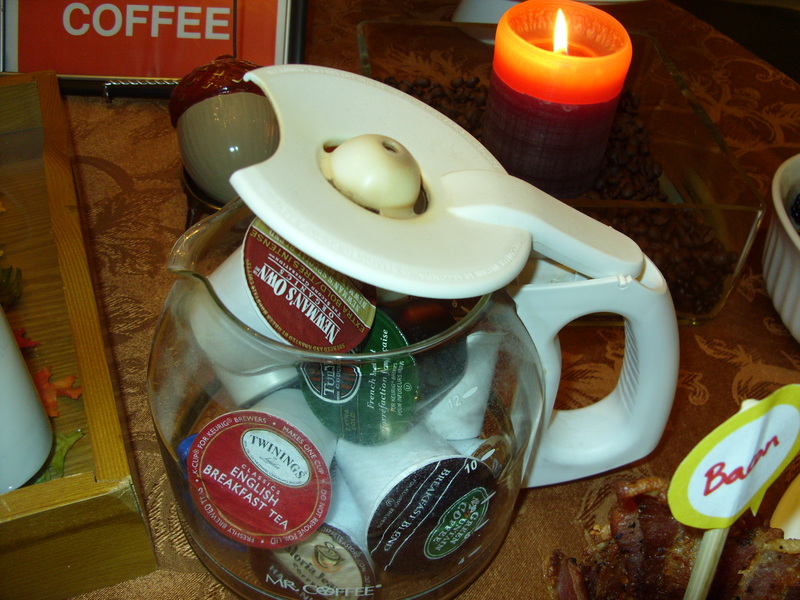 Everyone gets an individually brewed cup of coffee – exactly how they want it! And it’s oh so easy on the host! 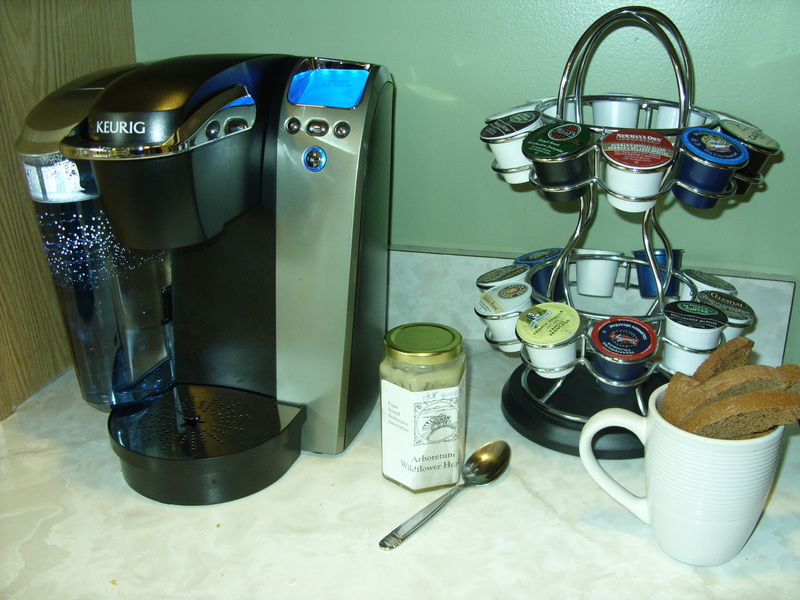 Even better, if you are not a coffee drinker – the Keurig makes tea and hot chocolate too. 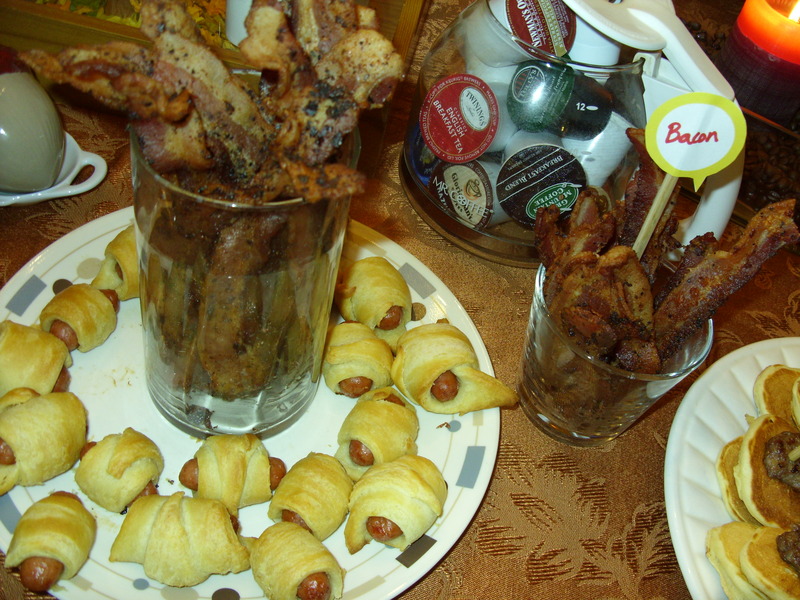 What is your favorite tip for entertaining guests while keeping it simple for yourself as the host?